Although a small town, Chagrin Falls has abundant green space. Our parks provide residents and visitors a place to play with their children, picnic outdoors, view three waterfalls along the Chagrin River or just enjoy a quiet walk in the woods. We have everything from a nature preserve nestled in the north section of town to large sports fields on the south side. No matter what type of outdoor space you prefer, we have something to meet your needs. Although our parks are free to all, organized events need to seek approval from local government. Our Parks Commission meets monthly. Located at Bell Street and Main, this is a small “pocket park” with picnic tables, several memorials, an antique fountain and views of the upper (man made) falls. A small seating areas and several staircases on both sides of the river provide a viewing area for the large waterfall located in the center of the village. Staircases are closed in inclement weather for safety. Located on Washington Street, this large field has a baseball diamond and two lacrosse fields. The back of the field provides access to hiking trails that connect to Frohring Meadows in the Geauga Park District. Not accessible by village sidewalks. Ample parking. 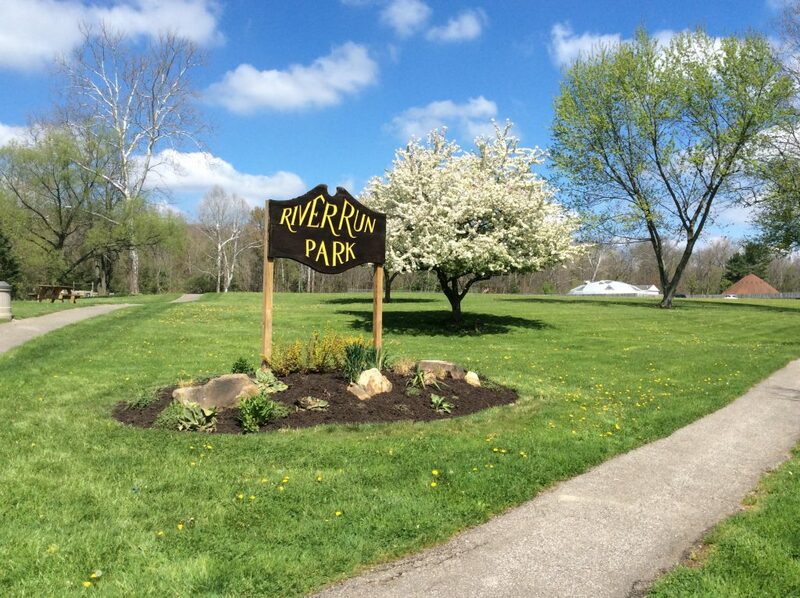 A baseball diamond, a bocce court, swings, playground equipment, walking path and a fenced bark park make River Run on Solon Road a great destination for family fun. There is a locked equipment box containing bocce balls and other small recreation items. You can check out the key at Village Hall during business hours or call/text Representative Angie DeBernardo for access off hours at 440-991-6488. All equipment is donated and offered on the honor system. Parking available, accessible by sidewalk. Located adjacent to the Chagrin River, stretching between local ice cream shops and the Chagrin Falls Library, Riverside Park houses a children’s playground, a covered picnic shelter, and ample green space. Off-street parking is available directly beside the park off of Orange Street. Each year, this park is the site of local festivals, including the Blossom Time Carnival and Art by the Falls. Accessible by sidewalk. Summer concerts and holiday ceremonies are often seen in Triangle Park – Chagrin Falls’ version of the village square. This small centrally located park features a historic Bandstand at its center, with paved walkways and planted gardens. This new park space is located on Vincent Street. The space will serve as an arboretum with a wildflower garden. It is will be dedicated to Ben King, the late chairman of our Shade Tree Commission. Chagrin Falls has been a “Tree City” for over 30 years now, largely due to Ben King’s commitment and leadership. Established in 1996 on former Chase Bag Company land, this nature preserve features a fast-flowing segment of the Chagrin river, a slow-flowing part with beavers, a swamp, a bog, forest, and field, all in a few small acres. Think of it as a sample platter of Northeast Ohio natural areas. Great place to walk a dog, fish, relax, and take photos. This entrance to this park is located at the end of High Street.